It’s fair to say that director Daniel Brooks (along with his regular designers Julie Fox, Richard Feren, and Andrea Lundy) has created a style of theatre that’s unique to him. 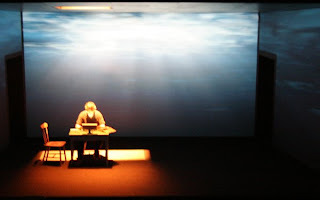 Nobody else in Toronto makes theatre that looks quite like Daniel Brooks’ and The Eco Show subscribes to his aesthetic of the last several years: sparse sets, hard-edged surrealist lighting, video projections, and of course loads of Feren’s sound cues. As I was watching the show last Thursday night, the whole time I kept thinking about whether or not the script, as written, could possibly hold up on its own without all the technical trappings. Probably not. But then of course, I had to ask myself if that was a fair question. I’m assuming that when Brooks is writing a script he has at least some sense of what the design elements are going to be in the show, since he’s going to be directing it ultimately, so he can consider that when he decides how much information needs to come out of the mouths of the actors. Still, the incredible reliance on technical effects to put across information made me think about how powerful words can be. While I’ve worked in a lot of different art forms, at my core I’m a writer and as a result I’m also a total word junkie. I love having things described to me with text, rather than seeing them happen on stage and I felt like, particularly with the video aspects of the show, while ideas may have been presented more concisely using images, they could have been presented far more effectively using words. I’ve seen a lot of Brooks’ work over the years and it pains me to say this, but I feel like he’s stalled creatively. If I had never seen anything he had ever done before, I think I would have liked The Eco Show a whole lot more. The fact is that I didn’t see anything new from him in this piece, just a recycling of the same tricks he’s been using for years. Not that they aren’t good tricks, but you can only watch a magician pull a rabbit out of a hat so many times before it starts to get stale. Not only that, but given how resoundingly he’s blown me away in the past, I just expect more of Brooks than I do from other artists. He was the inaugural winner of the Siminovitch Prize, has a shelf full of other awards, and is probably the best known and most lauded director of contemporary work in English Canada right now. I want to see him push the medium forward as he has in the past, though I can’t say he’s achieved it with this piece. Maybe it’s the struggle of having set the bar so high with his previous work that he just can’t top himself. If that’s the case, then perhaps it’s time to try something else. Speaking of which, the other thing I was thinking as I was watching the show is that maybe Brooks actually wants to be making films (even if he doesn’t know it yet). Given what he’s done for Canadian theatre, he could be a welcome (revolutionary?) voice in Canadian film and the subtlety of the acting style he asks of his cast in this show along with the sonic backdrop that Feren provides seem to have more in common with the big screen than the small stage. Some people get really agitated at the thought of theatre artists making the transition to film, but for me it can be a very logical next step for an artist who has either stalled or achieved all they can creatively in a specific medium at that time. As well, there are artists who’ve been successful moving back and forth between the two forms, so shooting a few reels of film does not instantly mean that you’ll never set foot in a theatre again. Making films could be a new challenge for Brooks and I think it might be a welcome one. No one can deny that he’s an absolute master of the theatre, but maybe it’s time to try mastering something else. The actors (Richard Clarkin, Fiona Highet, Joe Cobden, Jenny Young, and Geza Kovacs) as father, mother, son, daughter, and grandfather, respectively, all do fine work, though I feel like Brooks has taken them down to such a level of subtlety in their performances that I need close-ups shots as there would be in a film to really get what’s going on. I should qualify that by saying I was sitting in the back row of the theatre (all the better to take in the whole picture) but as any skilled actor will tell you (and this is a group of skilled actors) you need to reach the back row of the audience as well as the front. Though it didn’t blow me away, The Eco Show is probably worth seeing, if only for the fact that you’re not going to see anything else like it in Toronto right now. If you’ve never seen Brooks before, it will probably be mesmerizing, and if you have, it will give you more ammunition when you have cocktail party conversations about the stagnancy of the old guard of Canadian theatre.